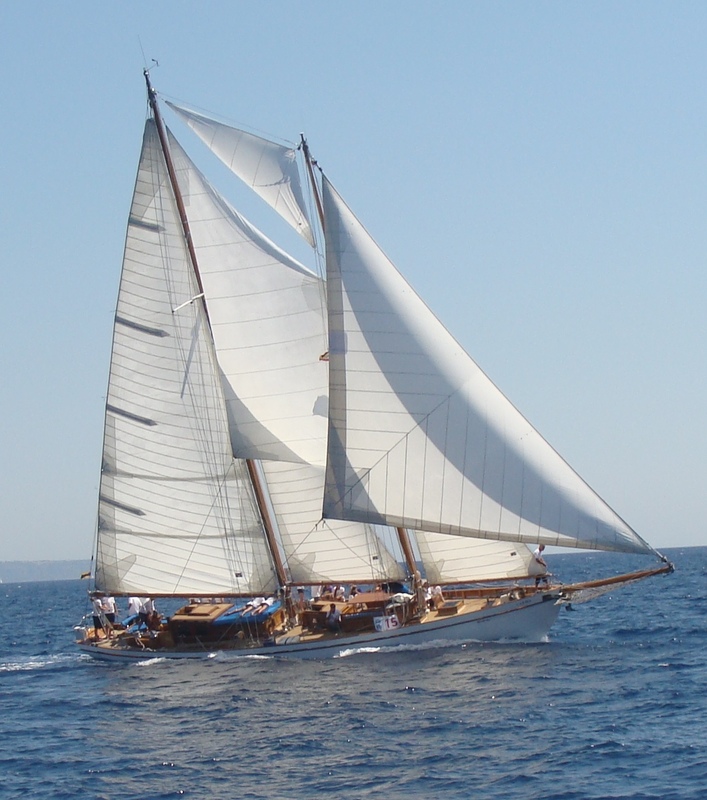 Launched in 1930 at the Chantiers de la Liane in Boulogne-sur-Mer – in Nord-Pas-de-Calais Region of France, near the Belgian border – from drawings based upon a John Alden design-concept, the ‘Aloha-R’ was built for the Hennessy family of France. 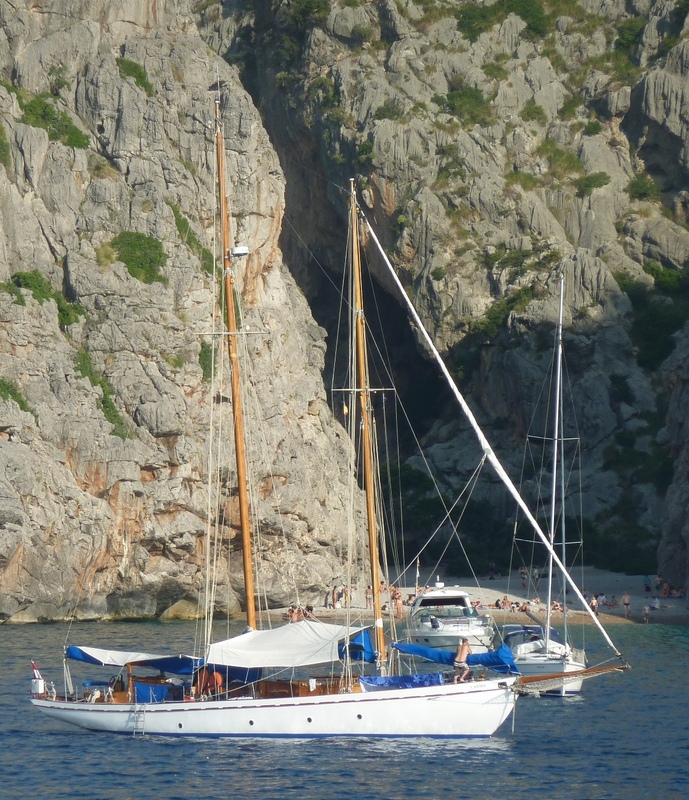 This fine 24 metre classic schooner has certainly had an interesting, eventful, and exciting life after eighty-four years at sea. 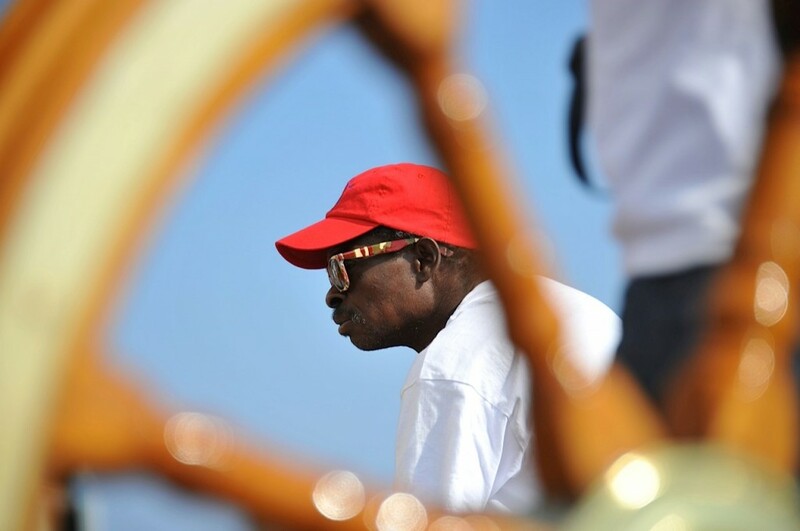 Although her first log-books are long since lost to history, she has witnessed many milestone events in the world, undergone changes in her own name and ownership, experienced challenging sea-voyages and weather conditions, and fought hard as a participant in many competitive regatta sailing events. Her first decade cruising in Spanish and western Mediterranean waters coincided with the Spanish Civil War, and thereafter the equally bloody years of WWII, and it is believed that she may have been involved in certain clandestine operations between Spain, France, and the African shores during this time, and later again during the time of the ‘private-trade’ in these waters. 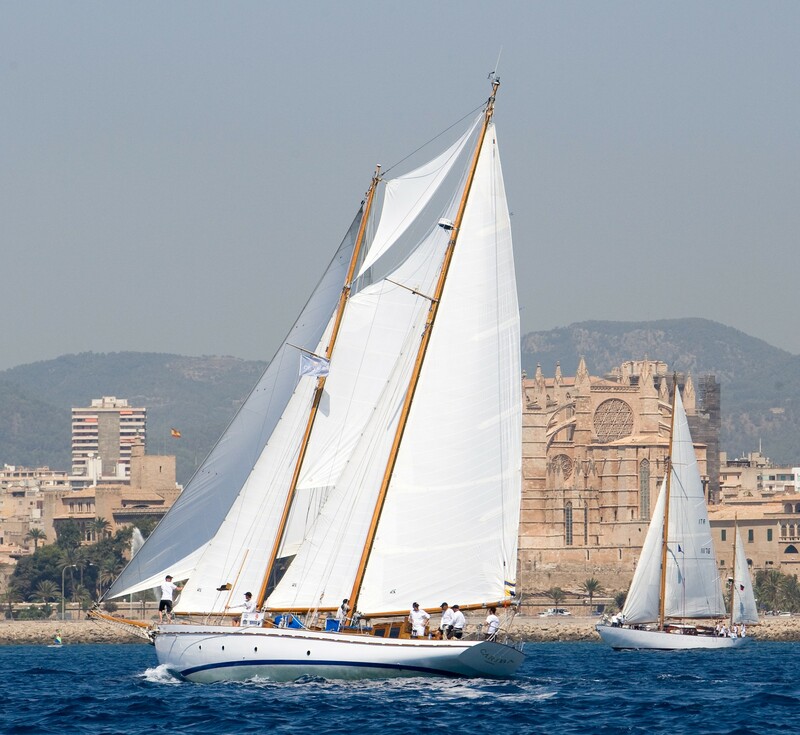 In 1976 she was purchased from her then Belgian owner – carrying the name ‘Boheme’ at the time – by a German buyer, and renamed ‘Cariba’, continuing to cruise both the eastern and western Mediterranean seas, and spending much time initially in Ibiza and Mallorca. 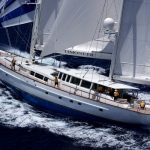 She has often voyaged to the West Indies and has traversed innumerable times the unpredictable waters of the Mediterranean Sea, eastern and western sectors, regularly visiting Italy, France, Greece, and Turkey during the 80’s and 90’s under the command of Gert Kunzendorf, her caring Master for 35 years. 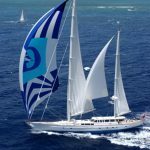 One of her current co-owners was first invited aboard the yacht as a guest in 1990, when she was named ‘Cariba’, and as a young yacht-captain was much taken by her fine lines and innovative and comfortable layout – both above, and below decks. 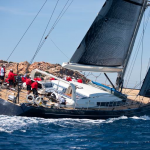 Some 20 years later in 2010, when she became available for purchase while lying at Palma de Mallorca, this same captain – now not so young anymore but not quite yet an octogenarian like the stately yacht…! 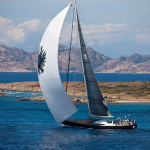 – and two close friends of his, were able to purchase her and keep her voyaging at sea and continuing to provide a superb platform for sailing and entertaining, and as a space for the on-going exchange of old sea-stories, maritime knowledge, and philosophical ideas. 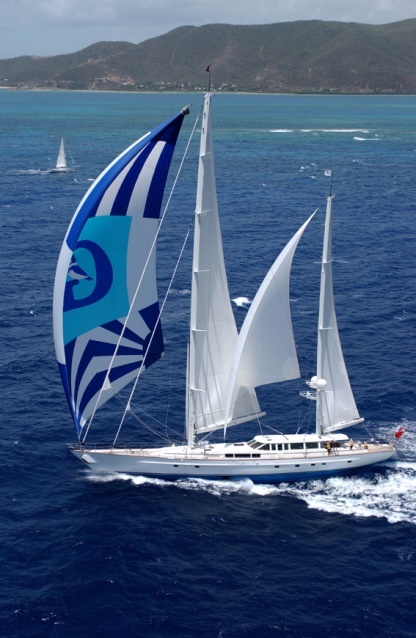 On agreement with her previous owner, her name was changed back to match her original and first name, although her last name was also incorporated in the re-naming, thus maintaining threads of her historical journey; she become the ‘Aloha-J of Cariba’. 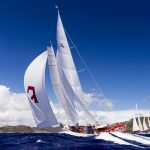 As ‘Aloha-R’ she was originally rigged as a Gaff-Schooner in 1930, and with her gaff-mainsail, she sailed under a powerful configuration of sail. 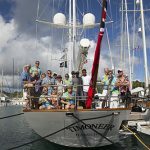 However in later years, in order to make her more passage-friendly for cruising family and crew, her mainsail gaff was removed and she was re-rigged as a Bermudan Schooner carrying a Marconi-type rig, flying Mainsail, Main-staysail, Foresail, Roller-yankee, Fisherman, and Topsail. 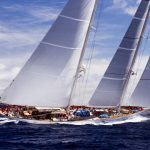 The removal of her gaff and Main-topsail – and hence her vast and powerful mainsail sail-area – greatly reduced her competitive ability, and she is no longer a match for her similarly drawn sister-ships such as ‘Malabar X’ and other similar gaffers, which still carry their original rig and sail-area. 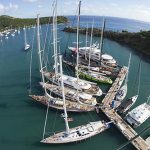 The re-rigging did however result in a very easily manageable sail configuration, allowing safe and comfortable passage-cruising in even brisk and heavy weather – without the need to often reef or reduce sail. 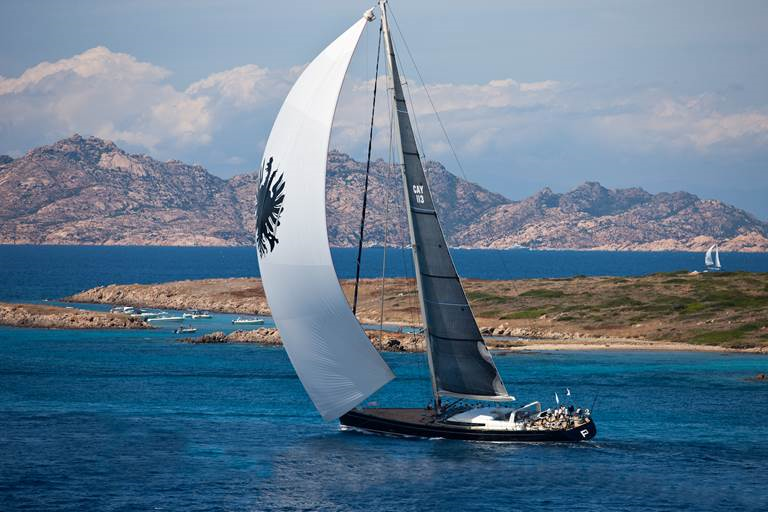 Her current owners are now also able to handle all sails with ease with a small crew, and even sail her single-handed from time to time; the only down-side being that she now no longer achieves the expectation of old whilst racing against competition of similar design. 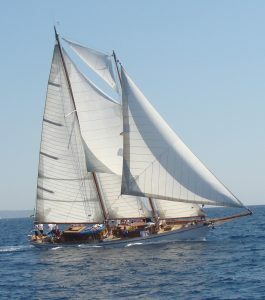 Ever the graceful and eye-catching lady ‘Aloha-J of Cariba’ continues to visit the ports and anchorages of the Balearic Islands of Mallorca, Ibiza, and Minorca, occasionally racing in the various local regattas, and with a passage-plan drawn to continue to visit old stamping-grounds of Mediterranean France, Italy, Croatia, and the Eastern Mediterranean, providing as always a delightful movable feast and continuing to teach and nurture all who sail with her. 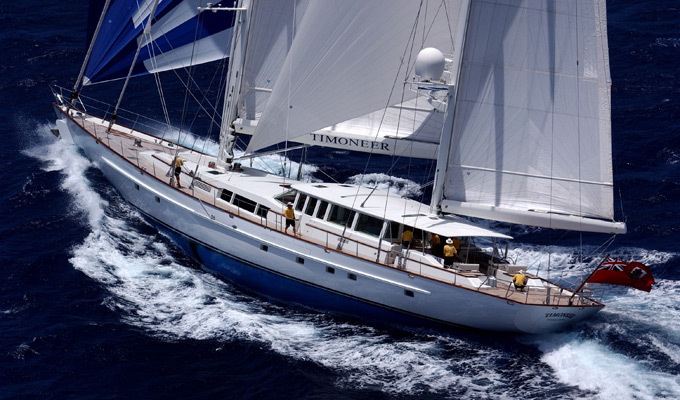 Launched at Vitters Shipyard in Holland to an Ed Dubois design, ‘Timoneer’ is a powerful 45 metre super-yacht cruising ketch. 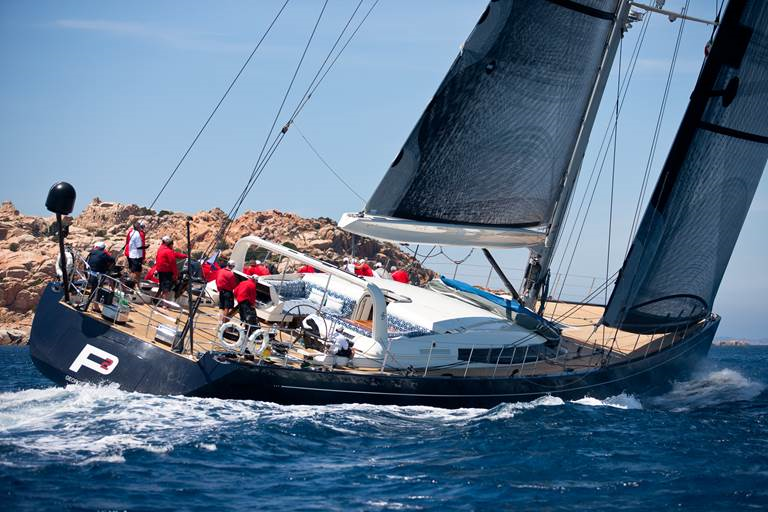 She was built for an American owner who was well experienced in yachting and who’s family are passionate about sailing. 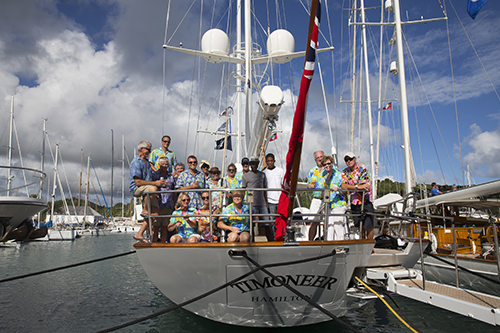 Sailing both Mediterranean and Caribbean waters each year, ‘Timoneer’ has covered many sea-miles in her prestigious career. 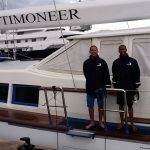 Recently berthed in Nelson’s Dockyard in English Harbour, Antigua, in the Caribbean, her owner kindly invited two local youngsters to join her professional crew during the Antigua Superyacht Challenge in January – giving these young local sailors a taste of what it is like to crew aboard, and race aboard, a powerful and magnificent yacht of this calibre. 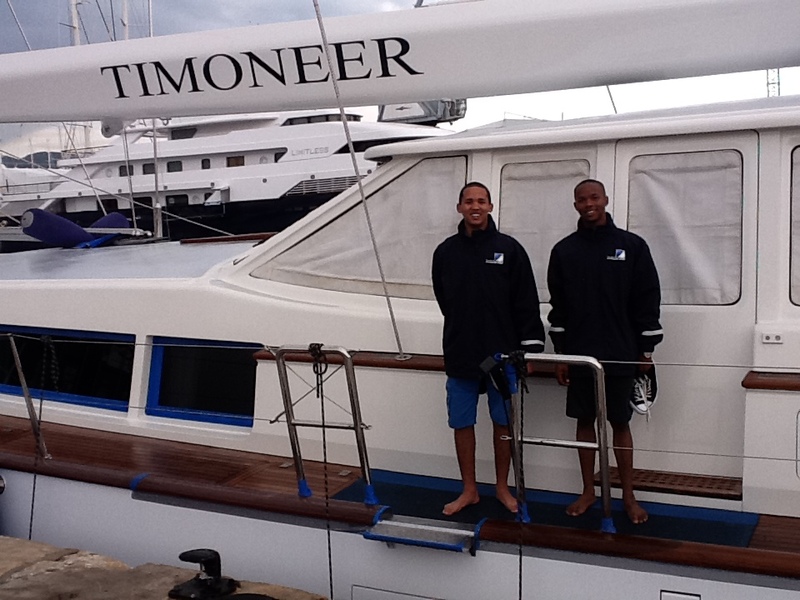 What a dream experience for these two young men…! 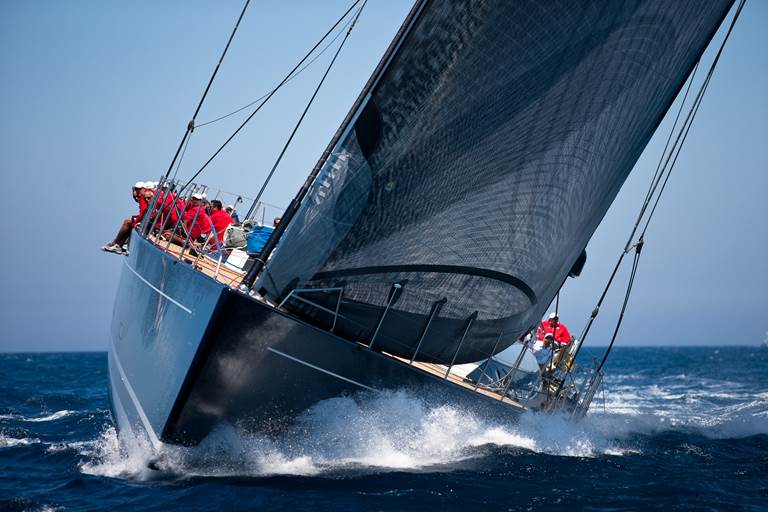 “Designed by Philippe Briand and built by Perini Navi in Italy, ‘P2’ is a 38m high performance cruising boat. 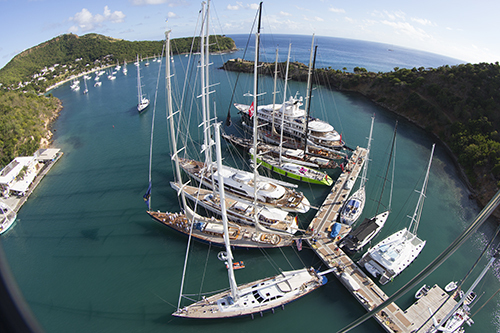 ‘P2’ features 3 guest cabins and 3 crew cabins and a lightweight modern interior. 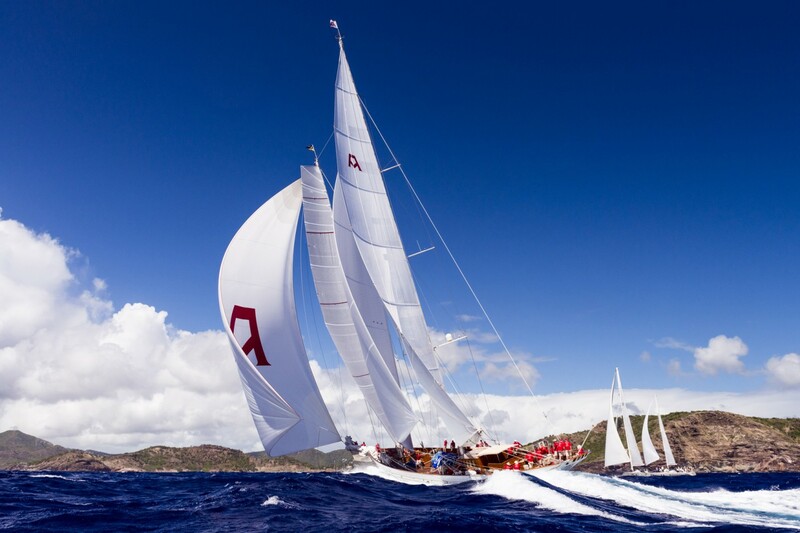 Whether she is on the race track or island hopping with owner and guests, ‘P2’ attracts admiring glances due to her sleek lines and powerful sail plan.” The yacht begins racing this week in the dynamic ‘Loro Piana Regatta Rendezvous’ in Virgin Gorda in the British Virgin Islands (10 – 14 March), kindly inviting two young local sailors aboard to participate and experience the racing and sailing atmosphere aboard in company with ‘P2’s professional crew. 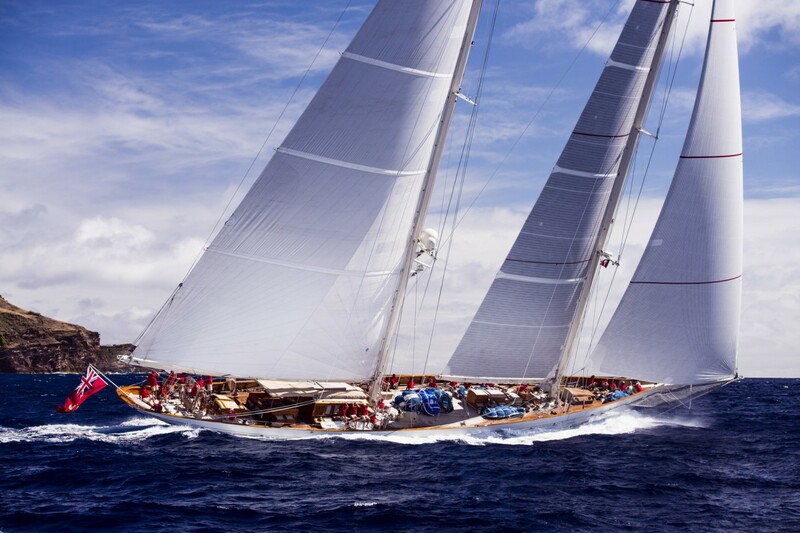 Originally built in 1903 in Southhampton at J.G Fay and Co. to a design by W.C Storey, ‘Adela’ was restored and remodelled by Pendennis Shipyard in Falmouth, England, and naval architect Gerard Dykstra between 1996 and 2000. 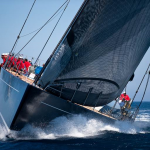 Today she blends her original charm and elegance with modern equipment technology, presenting a most competitive racing yacht and not to mention stunning sight under full sail out on the water.